A Hyatt Contractors Ltd - Builder, Driveways/Patios/Paths based in Henfield, West Sussex. 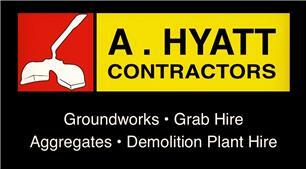 A. Hyatt Contractors is a local family run buisiness, which offers services such as groundworks, driveways, demolition, hire services, aggregates suppliers and civil engineering contractors. With the goal of being the best in class, customer trust in A. Hyatt Contractors to deliver projects safely, on time and on budget, and with care for the environment and our communities. We are able to use all of a our own plant and equipment to keep cost down and so we can deliver the project on time with no delay.